Finding financial data, particularly for private companies, is no small task. It usually requires a solid BS detector for researching online and a network of knowledgeable sources to bounce numbers off of — not something that can easily be done over coffee or in the middle of a meeting. PitchBook, a PE and VC database, is integrating financial data into its mobile app to chip away at this problem. The update is bringing financials for 266,000 companies, including revenue figures for 145,000 businesses, to its mobile app. That’s on top of the startup data the company provides that includes rounds, investors and other history. When available, PitchBook is also providing balance sheet summaries and valuations. The company is seeing growing demand for its mobile offerings. 25 percent of active PitchBook users are on mobile each month, a 54 percent increase from this time last year. Most of the private startups cataloged by PitchBook don’t have complete financial data. This means that, for most companies, you will only be able to see a sampling of revenue numbers and public SEC filings. The addition seems more about co-locating all known information about a given company. It would be nice to see PitchBook and its competitors do more with natural language search. As of now you can’t search “Revenue for Uber” and get a result immediately. 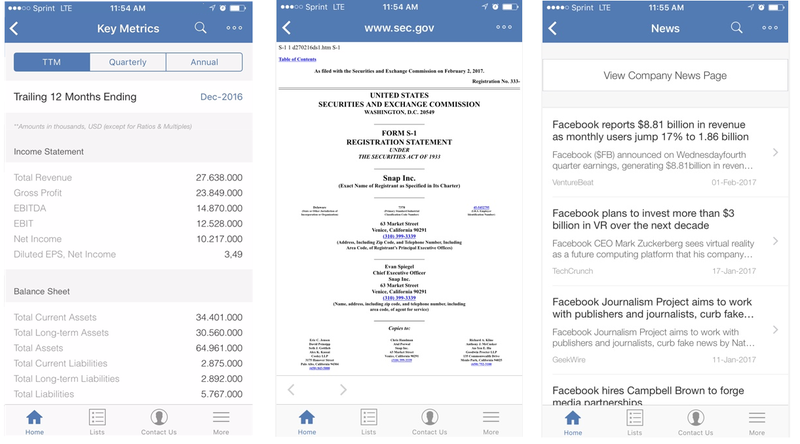 The design of the current mobile app prioritizes access to information over analysis. This move makes a lot of sense and fact checking probably covers a majority of use cases for accessing investment data on mobile. But in lieu of analytics features for power-users, the company should try to fully deliver on its promise to get financial data in the hands of decision makers as fast as possible. “We’re working on tighter device integrations with SiriKit and trying to rank better within Spotlight search,” said Alex Legault, PitchBook’s lead product manager. PitchBook has no shortage of competitors. CrunchBase, CB Insights, Mattermark and others all have solid databases for investors, but PitchBook’s relationship with Morningstar should help to differentiate it with solid offerings for investors across industries in both public and private markets. Morningstar acquired PitchBook for $225 million back in October 2016. Legault says that PitchBook is feverishly adding non-tech companies to its database, a move that should be appreciated by the traditional PE subscribers of Morningstar. But the larger corpus of businesses couldn’t come at a better time for PitchBook’s 2,000 clients and 7,000 active users. Even in early days, the number of non-tech companies involved in tech acquisitions is substantive and set to increase in the coming years.